Natali S. Bravo-Barbee is a process-oriented photographer who uses a combination of digital, analog, and alternative photo-processes to retain and interpret memories. She mines the archive of her family’s possessions to explore her own identity as an immigrant to Queens from Argentina – often creating cyanotypes of objects or clothing. In c.1986, a child-sized mannequin wearing a white-satin button-down blouse with lace collar and a ruffled red-satin skirt stands opposite three cyanotype prints of lace collars adorned with glitter and crystals. 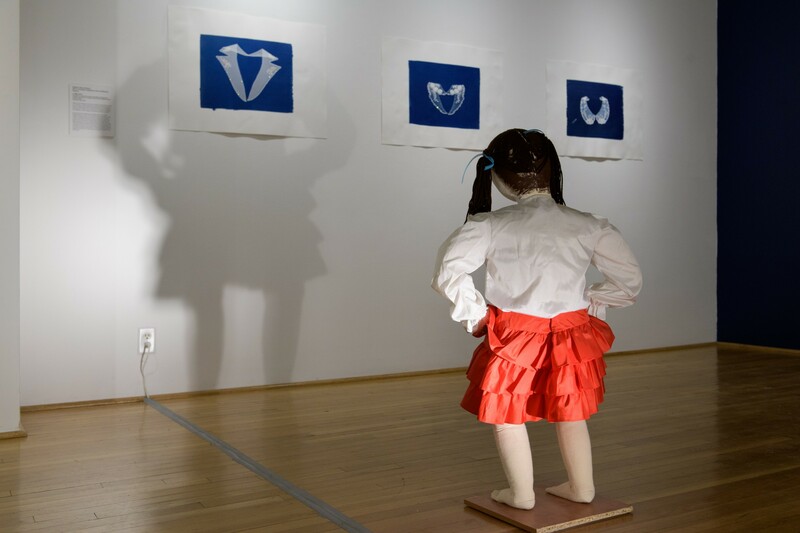 The small mannequin appears to question the collars she contemplates as her grown shadow is cast on the wall. This outfit was Bravo-Barbee’s favorite when she was three years old; the stains on the button-down blouse mark her first rebellions against her mother’s gendered expectations.